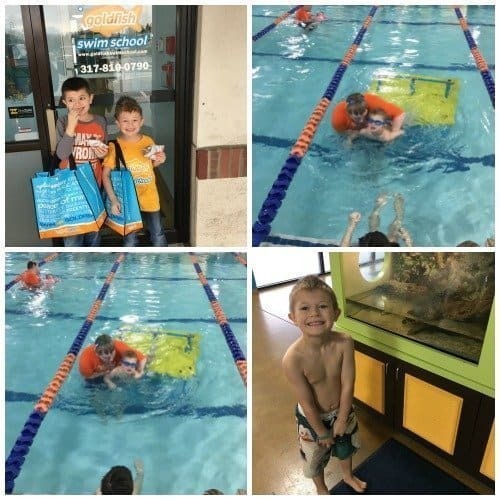 This post was written in partnership with Goldfish Swim School. My six-year-old hates water. He’s hated it since his first bath. Anything that involves getting his face wet he avoids like the plague. That has made learning to swim pretty difficult. However, learning to swim is incredibly important, both for my kids and for my own piece of mind. We have family members with pools, and I want to know that if something should happen and they end up falling in, they can keep themselves afloat. So even though my little guy hated the idea, we signed up for swim lessons last summer. It did not go well. The class had a very “one size fits all” approach, and the teachers didn’t seem to know what to do with a fraidy-cat like my son. Lessons became a constant battle that ended in tears for both of us. When I heard about Goldfish Swim School and their unique approach to swim lessons, I thought that it might be a better fit for our family. Rather than having sessions of swim lessons every six weeks, Goldfish offers continuous lessons year-round in a gorgeous indoor facility. Classes never have more than four kids, so each child gets lots of attention. Kids aren’t moved up to the next level until THEY are ready. How’s it going so far? Well, we’re four weeks in, and there have been minimal tears. My little guy finishes each lesson excited about what he can do, rather than depressed about what he can’t. And he’s starting to put his face in the water! THIS IS A BIG DEAL. His progress has been slow and steady, but I’m ok with that. Any progress is awesome in my book! In addition to swim lessons, we’ve been doing lots of reading about the water and learning to swim. Seeing characters in books struggle with the same fears has been helpful for my son. These books may be helpful for your little one, too! 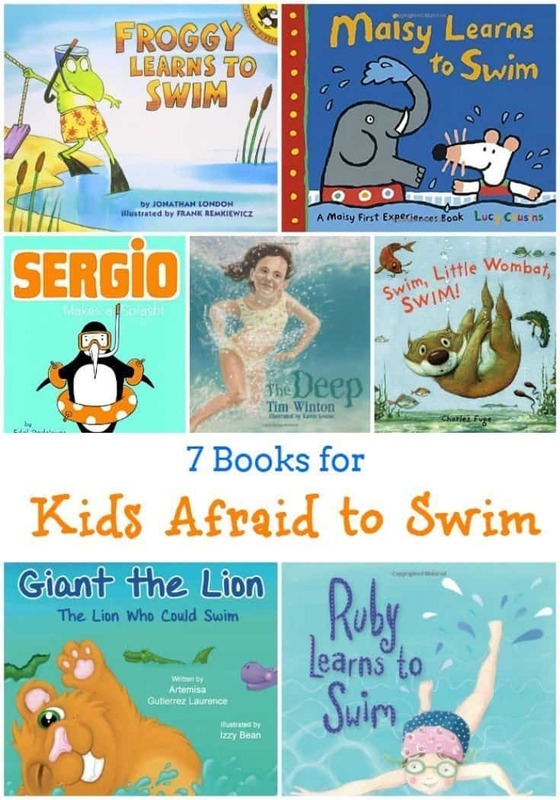 If you have a child who is scared to get in the water, consider checking out a few of these awesome reads. Amazon links are referral links. Froggy Learns to Swim by Jonathan London — Frogs are known for being great swimmers, but not Froggy. Froggy is afraid of the water! With some help, Froggy gains confidence and learns to love the water, and soon he doesn’t want to get out! This book is a great read-aloud with preschoolers or younger elementary kids. Swim, Little Wombat, Swim! by Charles Fuge — Little Wombat teases Platypus for having a funny face and walk, but he soon learns that Platypus can do something Little Wombat cannot — SWIM! The two become friends, and Platypus helps Little Wombat learn the fun of being in the water. Sergio Makes a Splash by Edel Rodriguez — Sergio loves water. He loves to drink it, take a bath in it, splash in it. But Sergio cannot swim, and that keeps him from having fun with his friends. A school trip to the ocean forces Sergio to decide if he will face his fear and learn to swim. Giant the Lion: the Lion Who Could Swim by Artemisa Guiterrez Laurence — Giant the Lion really wants to learn how to swim, but he’s scared of getting in the water. Thankfully, he has some great friends in the other jungle animals, who encourage him to take the plunge. Giant works hard and eventually becomes one of the fastest swimmers around! Ruby Learns to Swim by Phillip Gwynne — This adorable rhyming story is great even for toddlers who are getting used to the water for the first time. They will love the rhythmic style of this story, and after a few reads will probably join in! Maisy Learns to Swim by Lucy Cousins — Preschoolers love Maisy, and they’ll love this story about Maisy swimming with her friends. This book is a great one to read before your child’s first trip to swim lessons or the pool. The Deep by Tim Winton — Alice lives by the ocean, but she’s afraid to get out and swim in the beautiful waters. She longs to have fun with her family in the ocean, but she’s afraid of being in water where she can’t touch the bottom. This story is a great one to share with elementary-aged kids who are struggling with a fear of swimming.